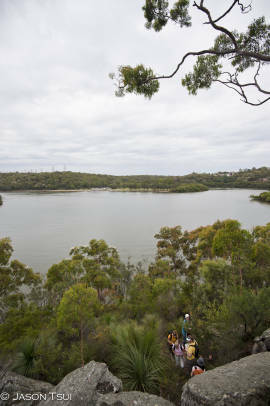 The Salt-Pan Explorer 6 hour Socialgaine was held in the Georges River National Park, Salt-Pan Creek, and surrounding areas. The event was officially declared the most social socialgaine ever! There were 261 starters in 97 teams. 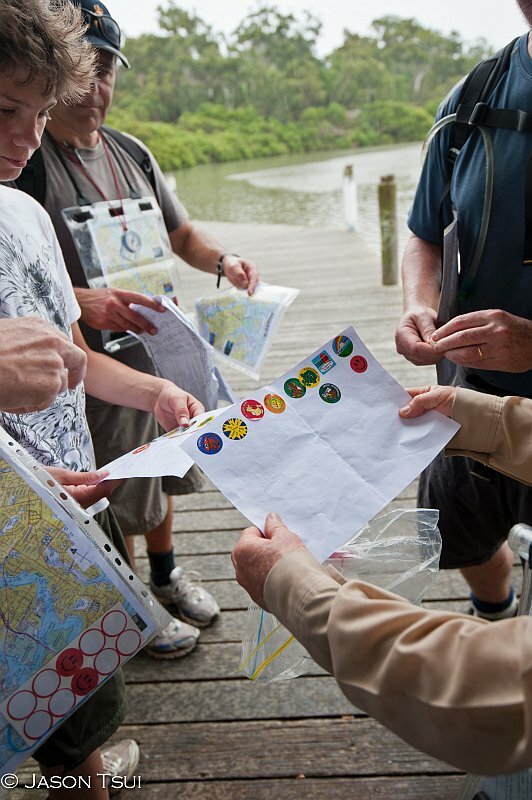 The organisers are asking for long or short comments or anecdotes from anyone who took part in this rogaine - especially enjoyable aspects of course: route choice challenges, nice places visited, satisfaction at getting across challenging terrain, etc. Write to the "[email protected]". I think we must have chosen our route fairly well as most of the other place-getters seemed to be following a very similar one and we crossed paths often with Richard & Ben, Jeremy & Steve, Lachlan & Malcolm, and (I think) Jess, Melissa & Warwick, and possibly others. I measured the distance we covered very roughly with a ruler at 32 km, but I was probably underestimating (and may have lost count as I was pretty tired while doing it). We moved at a gentle jog most of the time, except when attempting to decipher a clue, having something to eat, or going up a hill (of which there were fortunately very few, at least for the first half of our route). The stickers were a great idea. At first we despaired of ever collecting the set, especially as we didn't see anyone else from 12pm until nearly 1pm. I think we were lucky with the stickers though because we were able to make a successful trade with nearly everyone we met (against the odds) and after the initial drought we quickly gained the full set. Definitely a good addition to the challenge though, and added to the sociality of the day. Some of the clues were a bit ambiguous, but I'm not going to go into details because I don't want to give the impression that I don't think the setters did a fantastic job overall! This was the first time Claire and I have ever done any rogaining, but definitely won't be the last, we had a great day: saw a part of Sydney we'd never seen before, got a good workout, a good feed (the salad selection served to elevate the bbq well above the standard sausage- sizzle), and met a great bunch of people! Just wanted to say, what a fantastic rogaine yesterday!! Well organised, plenty of interesting decisions to make, and the sticker idea for getting people to interact was a beauty!! It was Peter Lui's first rogaine as well as the Prentice kids. I asked for a rating on a scale of 1 to ten and responses were 9, 11 and 11. My kids and myself had a great time. 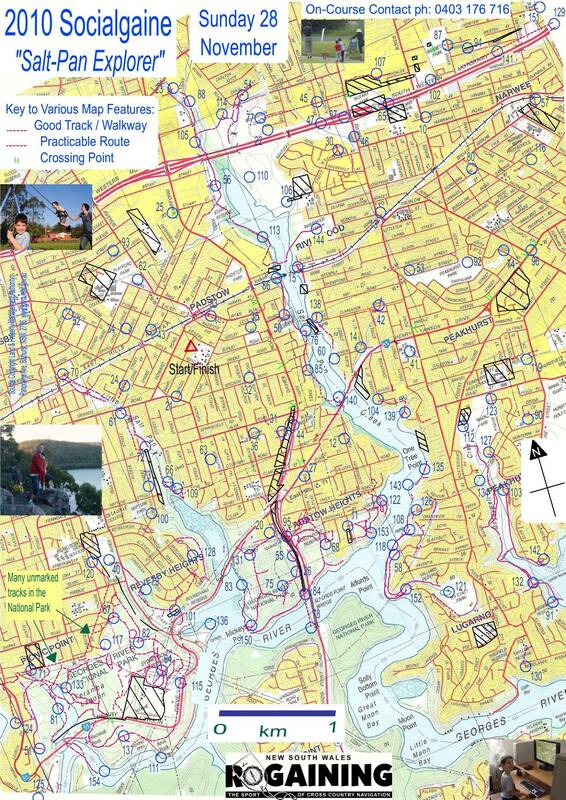 Being local (we live in Peakhurst) helped us a lot on the course, but we still discovered places, little reserves and spots along the river we've never been to. The kids were absolutely fascinated to walk to places we usually go to by car- "wow did we really walked that far!?!?" The parks and reserves - first Salt Pan Creek, then Peakhurst West Primary (the school they go to), Evat Park, Gannons, Peakhurst park, the creek again, Riverwood park, the former rubbish tip - all places we've been to, came one by one and the kids were absolutely trilled. We were also going quite good and knew we are with a chance for the family category and the competitive buzz was there (especially the kids) all the time. We even managed to run in the last 45-60 min. The stamps swapping was the icing on the cake and gave extra character and excitement to the whole thing (we've got 9). 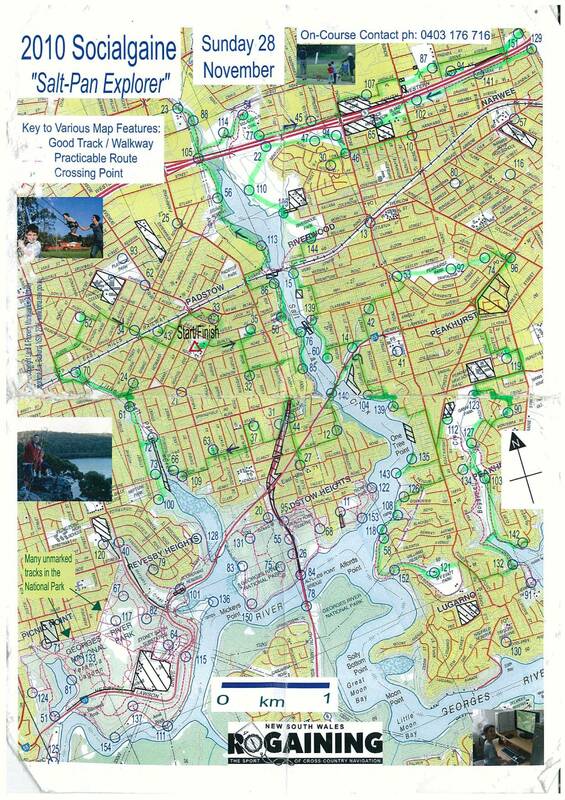 I now may use the map and the course do design a few new long runs for myself.